ISLA MAGICA reserves the right of admission to the Park according to the rules mentioned bellow. When the capacity is completed with the users already present in the park. For safety and comfort reasons, and in general, for the proper operation and enjoyment of the park in case of a large number of visitors, ISLA MAGICA my suspend the sale of tickets ad restrict access to the Park, except for those visitors that have made the relevant advanced booking. When the closing hour of the Park has been reached. When any visitor does not fulfil the minimum age requirement to enter the Park. Children under 7 must always enter and stay in the Park accompanied by an adult. When a person intending to enter the park has not paid for the appropriate ticket. To be able to gain entry to ISLA MAGICA it is indispensable to previously purchase tickets at the Park’s ticket offices or at authorised ticket sales outlets. ISLA MAGICA accepts no liability whatsoever, for sales made at any other unauthorized outlet. The entry tickets cannot be resold or reimbursed under no circumstances. No damaged or altered tickets, or whose validity date does not coincide with the day of use shall be accepted. Visitors must keep their tickets during their visit to the Park and must be shown to Park personnel when required. ISLA MAGICA reserves the right to evict from the Park whoever is not in possession of a valid tickets, unless a special admission procedure has been arranged. Any ticket-holder wishing to leave the Park and intending to return the same day, must request the appropriate identification on exiting. The said identification, along with the current ticket, are indispensable for re-entry. 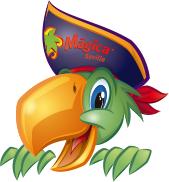 ISLA MÁGICA reserves the right to expel from its facilities any person that is making a fraudulent use of tickets and season passes, and it even may in the latter case, cancel such season passes temporarily for some time or cancel them definitively. When a person intending to enter the park does not meet the established specific admission conditions (see annex “specific admission conditions approved by the competent administration) displayed to the public in the access to the Park and in the ticket offices. When a person intending to enter the park or already inside of it shows a violent attitude, especially when such person behaves in an aggressive manner or causes trouble. ISLA MÁGICA reserves the right to expel from its facilities any person that violated its rules, has disorderly conducts or acts in any manner that may disturb or have a negative impact on other visitors. When a person intending to enter the park and carrying arms or any other item that may be used as such, except, and according to the regulation in force at the time, in the case of law enforcement officers or private guards of private security companies duly registered for such activity and entering the Park when performing their duties. Radios, weapons, flammable materials, explosives and dangerous objects are not permitted in the Park. For safety reasons, ISLA MAGICA reserves the right to inspect visitors belongings applying the appropriate procedures required. When visitors wear clothing or symbols inciting violence, racism or xenophobia. When a person intending to enter the park causes situations of danger or disturbance to other visitors or does not meet the minimum hygiene standards. Particularly, access to the Park will be prohibited to anyone consuming drugs or psychotropic or abuse substances or showing symptoms of having consumed them, or to anyone showing clear signs or behaviours of alcohol intoxication. For safety reasons, hygiene and politeness as well as respect the other guests, visitors cannot wear swimming suit, go barefoot or have the top part of the body unclothed during their stay at ISLA MAGICA. It is absolutely prohibited to swim in any of the water areas of the Park for safety and hygiene reasons. Visitors shall follow the indications or suggestions of ISLA MÁGICA’s staff in the waiting, access and use areas of attractions, shops, shows, restaurants and any other service within the Park at all times. Visitors are expected to show a respectful attitude especially in waiting areas. Reserving places or jumping in queues is prohibited. It is prohibited to sell any item or service not pertaining to Isla Mágica. Likewise, it is prohibited to distribute any leaflet, flyer or any other product in the Park. Access of persons accompanied by animals is not permitted, except in the case of persons with guide dogs, pursuant to Act Ley 5/1998, of 23 November on the use of guide dogs by personas with visual impairments in Andalusia. Access of persons carrying food or drinks to be consumed in the Park is prohibited. ISLA MÁGICA does not take any liability for any loss or damage of personal property of visitors while they are staying in the Park. Due to weather, technical reasons or any circumstances, ISLA MAGICA has the right to modify the Park’s opening and closing times as well as suspend partially or totally any activity being carried out at the venue, including attractions, shows, restaurants, shops, games, etc. For safety reasons access to attractions is regulated by specific rules: general conditions of use of attractions and specific conditions to access each of them. Such rules must be followed strictly and they are displayed for the visitors at the entrance of each attraction. Access to some areas of the Park may be restricted or they may be evacuated for technical or safety reasons. Visitors shall follow the instructions given by Isla Mágica’s staff in all cases. Theatres and show venues have a limited capacity. Access to them will remain open until their capacity is completed or until the show starts. During the performance access will be closed. In case of doubt, please contact ISLA MÁGICA’s staff. Access to Agua Mágica Seville implies that the client accepts the conditions listed in this regulation. 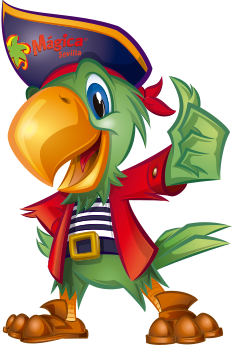 To enter the water, area it is necessary to purchase the entrance ticket to Isla Mágica-Theme Park, being both tickets valid for the same day. Tickets for Agua Mágica can be purchased in the ticket booths located at the Park’s entrance. Due to the type of enjoyment of the water and swimming facilities of the water area, its calendar and opening hours cover only the summer are independent from the season, calendar and opening hours of the theme park. Season opening and closing dates, as well as opening hours, are just for information purposes and may be subject to changes. The area has a limited capacity. Clients may access the area until it is filled to capacity. The management may establish two shifts to enter the area on peak days. It may also cancel the sale of tickets and restrict access to the park, except for clients that have purchased the ticket, made an advance booking or wear a wristband for the same day. It is mandatory to show the day ticket or the wristband of the same day worn on the wrist. Clients that may want to leave Agua Mágica and re-enter the water area will be provided with a wristband that must be shown at the access to Agua Mágica together with the specific ticket for the same day. Wristbands must be properly placed immediately and must be kept on while remaining in the site. Children under 12 must enter the area and remain in it an adult during their entire stay. Any person behaving in any manner that may put in risk the safety, hygiene, image or interests of Agua Mágica Sevilla will be prevented from entering or, where appropriate, expelled from the site. There are services in the site that are not included in the ticket prices, such as sunbeds, sunbed mattresses or lockers. No smoking is allowed in the site. Occasionally, some sections or the entire area may be closed for events or other activities. Certain services in the water area may be closed for technical, weather or operational reasons. Children under 8 may not be left alone in the facilities at any time. Agua Mágica Sevilla shall not be held liable for any accident suffered by children left alone, without the supervision of an adult, in the facilities. Identification wristbands are for personal use and cannot be transferred. Loss or break of wristband may result in termination of the contract and the subsequent expulsion from the site. Wristbands do not entitle clients to access all the water attractions, since such attraction have their own conditions of use based on age, height, or exceptionally restrictions for other activities. Agua Mágica’s staff may request clients to show their wristbands at any time during their stay in the site as well as when entering or leaving it. Access for season pass holders will be regulated by the specific conditions established for them. The following behaviours of users, clients of Agua Mágica Sevilla may entail their expulsion from the site. Lending or selling the wristband to another person. Misuse use of a non-valid wristband or of a wristband that belongs to another person. Displaying an aggressive behaviour towards other clients or Agua Mágica Sevilla’s staff. Any action that may cause physical, moral or economic damages to other clients, the park’s staff or Agua Mágica Sevilla. Showing signs of intoxication caused by alcohol or drug abuse. Failing to stand in queue or swimming accessories assigned to other clients. Risky behaviour for themselves or other clients while using the facilities. Agua Mágica Sevilla shall not be held liable for any loss, damage or theft of personal property or clothing in the site. Users must abide to the restrictions and conditions of use of the attractions and supplementary services offered in the park. Agua Mágica Sevilla shall not be held liable for any damage, trauma or any other problem caused by the use of attractions. Agua Mágica Sevilla shall not be held liable for the closure of any attraction or cancellation of complementary services for technical, weather or operational reasons.